When Peter Jackson chose New Zealand to film his epic Lord of the Rings trilogy it wasn’t just because he’s a Kiwi. The scenery is truly spectacular. It’s the best of America’s national parks all crammed into a relatively compact area. Picture if Colorado had not only the Rocky Mountains but also Yellowstone, Yosemite, and Grand Teton national parks; the glaciers of Alaska; a few Norwegian fjords; sixty-five volcanoes, rain forests, deserts plus almost 10,000 miles of coastline. And a lot of sheep. 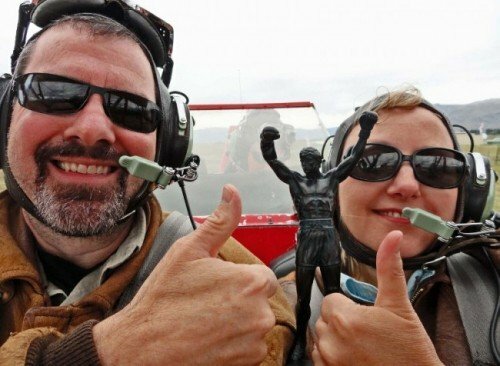 We had the opportunity to ride in an open-cockpit biplane over some of the natural wonders along with the Pelennor battlefield from LOTR:The Return of the King. We were driving back from a glacier hike near Mt. Cook when we saw a gorgeous flame red biplane sitting there gleaming by the side of the road. 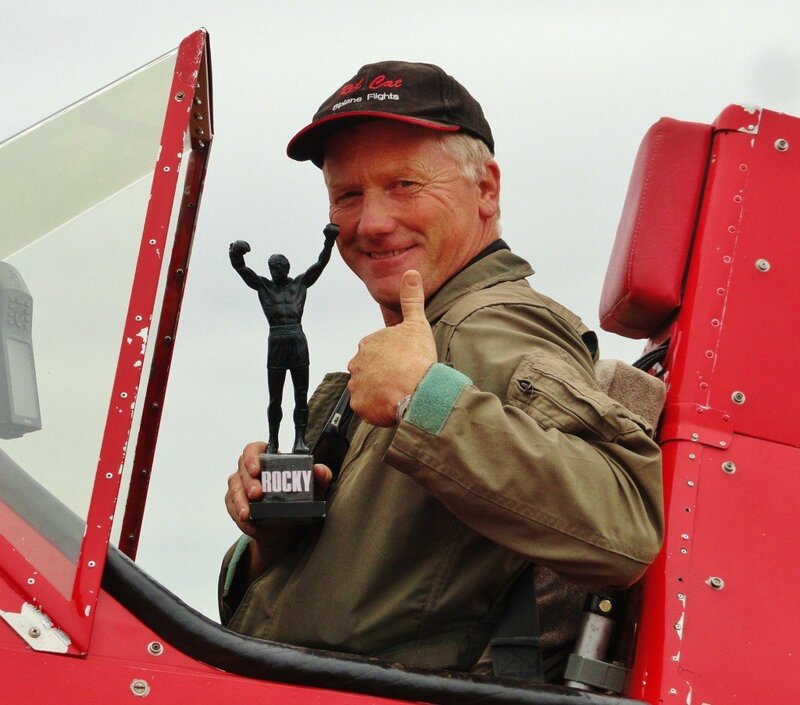 It was more effective than any billboard in promoting the business of Red Cat Scenic Flights run by pilot Chris Rudge. We’re both airplane geeks (which helps explain the vintage DC-3 at the top of our web site) but neither of us had ever been in a biplane. The experience flying in the plane is like a trip back to the barnstorming days of the 1920s. We were outfitted in leather flight jackets and goggles for the full Snoopy fighting the Red Baron effect. 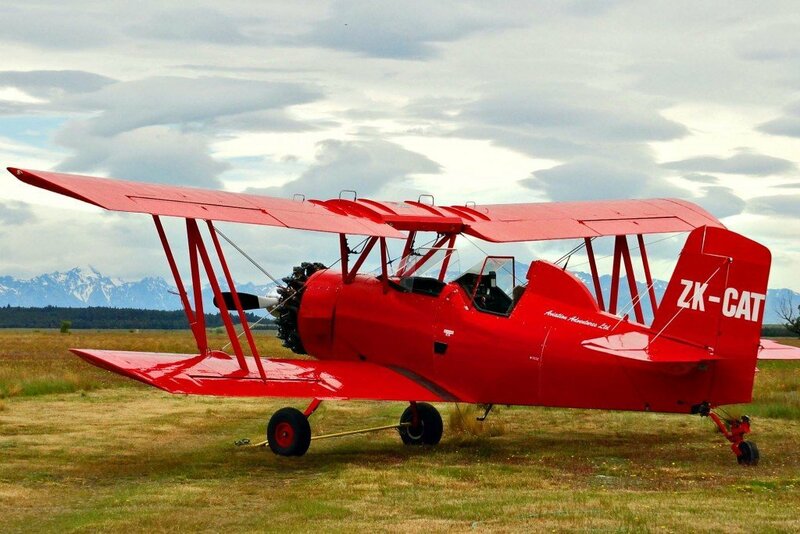 One of the unique features of Chris’ biplane, which he has named Red Cat, is that he can fit two passengers upfront, a rarity among biplanes. Michael hopped in (we use the term loosely) first and was quite comfortable until he realized Larissa would be squeezed into the confined space as well. Pilot Chris explained that the captain of the New Zealand rugby team had recently taken a flight with his dad and if they could fit in so could we, Larissa’s hips be damned. We buckled ourselves in but, quite frankly, we were jammed in so tight that even if Chris threw in a few barrel rolls I doubt we could have fallen out anyway. We took off using barely any runway and were airborne before we knew it. Red Cat circled the Takitumu Mountains and nearby glaciers before flying over the Pelennor Fields. Now Michael hasn’t seen any of the films but Larissa’s seen all three so she’s the expert on this. The battle scene in the movie required over 1,200 cast and crew, the largest shoot of all three films. We had driven by the site the day before but nothing matched the thrill of seeing it from the air with the wind in our face. Afterwards we wanted to keep the thrill going even longer but Chris made us give back the helmet and goggles. The experience helped us capture the thrill that the early aviators had in their flying machines. A few days later we were flying from Christchurch to Sydney inside a pressurized cabin eating salted peanuts. As we flew over the New Zealand mountains we looked out the window and wondered where Red Cat was flying today. 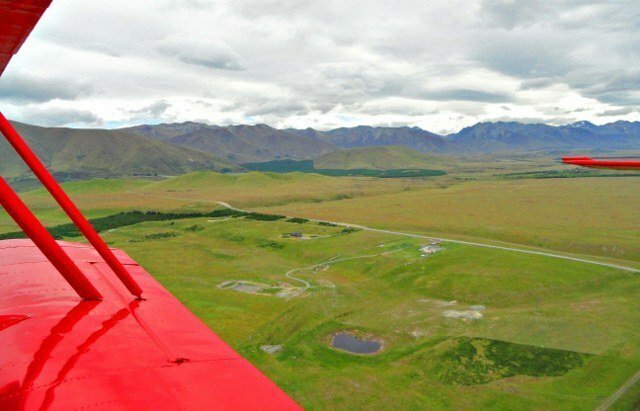 If you’re ever in New Zealand, which we highly recommend, here’s the link for Red Cat Scenic Flights. Click the link for more on our visit to New Zealand. Previous post: Update: Should you buy a Round The World ticket?